Koels herald the start of the stormy season and are called 'storm birds' by the locals. 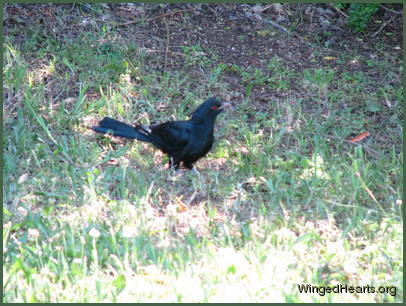 While as big as a crow or a currawong, by nature they are shy birds and tend to stay in hiding. Their red eyes match the mulberries in the tree and when they sit in the shade of the broad leaves, one would never guess that there was a big bird sitting only a few feet away. All the other birds are generally wary of cuckoos as they sense that someone devious is lurking in their midst. The koels know that they are not popular, but they do win favours by chasing the goannas and feral cats thus making friends and gaining the trust with some of the other birds. Having done so this male koel (left) was allowed to come out of hiding without any protest from the smaller birds that visit our yard. His mind and heart was elsewhere though as we discovered. 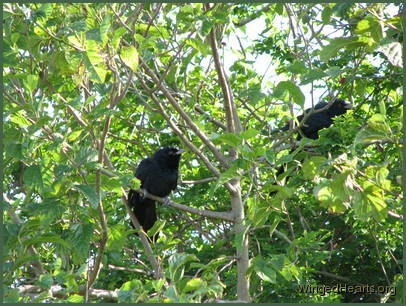 In the trees was hiding another male koel whose presence was causing him great consternation. It turned out that the tree was hiding another secret. 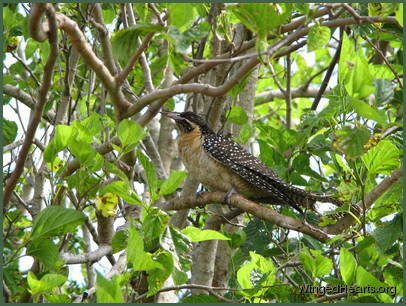 Closer inspection revealed a young female koel who was the centre of attention of the two vying young males. The lady honoured us by coming out after some gentle coaxing and sweet talking. Her two suitors spent the next few days charming and courting her with their songs. Once she declared her choice they flew into the deep bush leaving one lonely bird who called for weeks. We hope he found his sweetheart too. For your copy of the 23 Amazing Facts About Wild Bird Culture with true stories - click on this link and enter your details. Click here to find out more about the 30 day blog challenge. I will be bringing you many more stories this month.